As of March 31, 2014, everyone with a Disney park ticket can use MyDisneyExperience to book FastPass+ ride reservations in advance — yes, even off-site guests. You just need to have a valid, non-expired Disney pass (ticket) and link it to Disney’s MyDisneyExperience system via the web site or the app. This means it’s now a very good idea to purchase your park tickets at least 30 days in advance so you can book FastPass+. 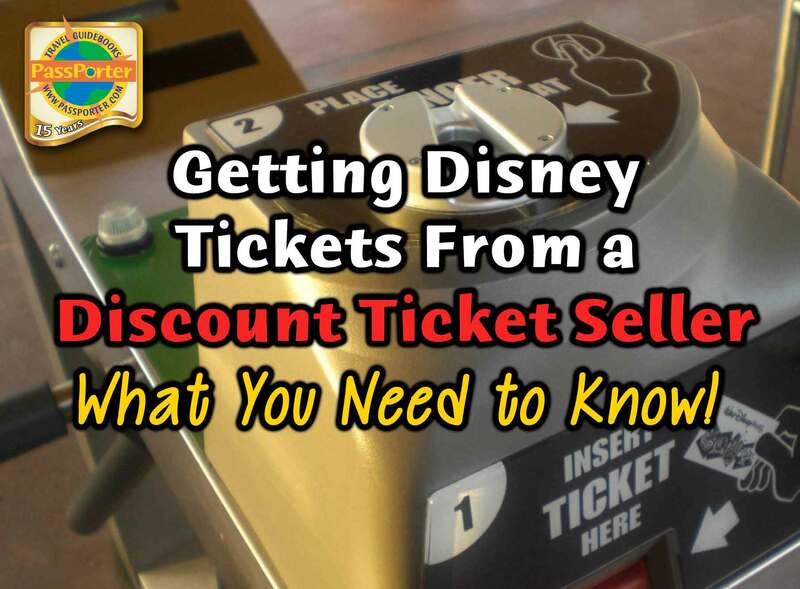 Sure, you can buy tickets directly from DisneyWorld.com and have them shipped to your home, but you can save money if you purchase tickets through a discount ticket seller. So let’s talk about that! First, what is a discount ticket seller? These are businesses that resell Disney tickets to the public — they buy in bulk at a savings, and then pass that savings on to you. Some are considerably more reputable than others. The key is to identify the ones that are reputable, and then find the one that offers the best discount for your particular purchase. We list several that have passed our tests in PassPorter’s Walt Disney World guidebook on page 123, but there’s one in particular we recommend: MapleLeafTickets.com. So why MapleLeafTickets.com? We’ve known MapleLeafTickets for many, many years — they are the oldest contracted discount ticket agent for Walt Disney World and we’ve purchased tickets from them in the past. MapleLeafTickets.com has an A+ rating from the Better Business Bureau. They have an actual, physical office in Kissimmee (4647 W US Highway 192) that you can visit. And they are responsive — e-mails get answered quickly and completely. They sell real Walt Disney World tickets; not vouchers, e-tickets, or will-call tickets. You get “hard tickets” mailed to you that are just like the ones sold at Disney’s ticket booths — you take those tickets you receive right to the gate. They are RFID-enabled, too! Their tickets have the same benefits as those purchased at Disney and their numbers can be attached to your MyDisneyExperience account. In fact, I wrote to MapleLeafTickets (as well as other ticket sellers) recently when the new pass prices came out and I got an answer within an hour. I was so impressed with this that I decided to work with them to offer some excellent park pass prices for PassPorter readers, which I’ve not ever done before in our 16-year history. At the time I am writing this article (April 2014), their prices save you 80-95% off full gate price, plus $1-2+ extra on several different pass options compared with other discount ticket sellers, especially on Magic Your Way base tickets without park hopping. For example, the lowest price I could find on a 3-day Magic Your Way base ticket (from the “secret link” folks talk about on our message boards) was $1.89 more than MapleLeafTickets special prices for PassPorter, while a 6-day was $2.18 more than MapleLeafTickets. It should be noted that MapleLeafTickets charges for their shipping, but it gets there quicker and you can always pick your order up free at their office. Are terms and policies spelled out up front? Look for a FAQ or Q&A link and read it first! How do you get your tickets? Are they shipped? Can you pick them up on arrival? You need the options that best meet your needs. What do you want to avoid? Anyone offering free tickets — there’s no such thing, and you can be sure there’s a scam or timeshare hardsell involved. So by now you’re wondering .. where are these great park ticket deals for PassPorter readers? I like to reward loyal readers, so first dibs go to our PassPorter’s Club passholders (see link) and to our PassPorter Newsletter subscribers. So if you’re not a Club passholder, make sure you’re subscribed to our free weekly newsletter and look for a link to begin apparing there this week! If you’re not currently subscribed to our newsletter and really really want to see those prices now, try asking on the message boards! Let me know if you have other questions about buying and using tickets from a ticket seller! Not a good deal for Canadians. They are maybe $1 cheaper then UT, but unlike UT they charge $20 to mail to Canada. You don’t find out about their shipping charges till you check out. Thank you Jennifer. Because we have APs we don’t really use UT much these days, but I did use them recently for Universal tickets, after price increase was still able to score tickets at old price, with free shipping to Canada. Any time I have used them I’ve been surprised at how fast the tickets arrive. Great service. It would be great for us Canadians if Maple Leaf gave free shipping, otherwise UT will remain our best option. As for free shipping, I’m actually discussing that option with MapleLeafTickets now, so please stay tuned! I have used Maple Leaf Tickets in the past, and would highly recommend them. I had two different orders, but I called and they only charged me one shipping fee and sent them in one package.